The sweeping melodrama of a shoot-em-up set on 17th-century Mars called for an equally dramatic score. For this project, I drew on the aesthetics of epic Hollywood film music as well as classic videogame themes. Final Form Games, the team that developed Jamestown, asked me to create something grandiose and epic to accompany their co-op arcade adventure. 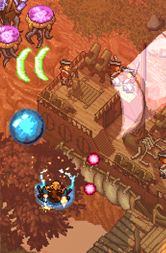 Though the game is presented entirely via pixel-art graphics, they wanted to steer away from “chiptune” sounds and create something more epic: a full orchestral score, in the style of a Hollywood blockbuster. Like what you hear? Go ahead and drop me a line!